Hard to believe another year of football has already started. Is anyone else as excited as I am? Honestly though, if I hadn’t won week 1, I probably wouldn’t be writing this post because I’d be too T.O.’d to talk about it. My team is The Billy Oceans and we’re going on our 11th year with the “Caribbean Queen” singer as our namesake. The best I’ve ever finished was back in 2010 when I came in 2nd. Standouts on my team that year, and these names are really gonna jog your memory: Peyton Hillis, Tony Gonzalez, Mario Manningham, LaDanian Tomlinson, and of course, my quarterback Matt Ryan. Here’s my problem, though. I usually draft with my heart, not my head. So I end up with players I like, who may not necessarily be the best players at their position. It’s why I’ve had Matt Ryan almost every year since 2010. Fortunately, he’s an elite quarterback but an example of how this can hurt me is drafting Kelvin Benjamin in the first round last year. He had a great rookie season but there was no reason to use my first round pick on him when I could have picked him up in the 3rd of 4th rounds at the earliest. Not many changes but I was able to pick up Kerwynn Williams who will be the Cardinals #1 RB while David Johnson is out, and Sanu added in place of Sterling Shepard. I’m hoping to get week 1 production out of Ryan, Howard, Gillislee, Bailey, and the Steelers D; added value from Ajayi’s first game of the regular season, Golladay having a good game again; and more production from Kelce and Adams. Who was your first round pick? Anyone you have your eye on for the upcoming weeks? Feel free to share in the comments below! It’s like the perfect storm of random elements coming together at just the right time for comedians. 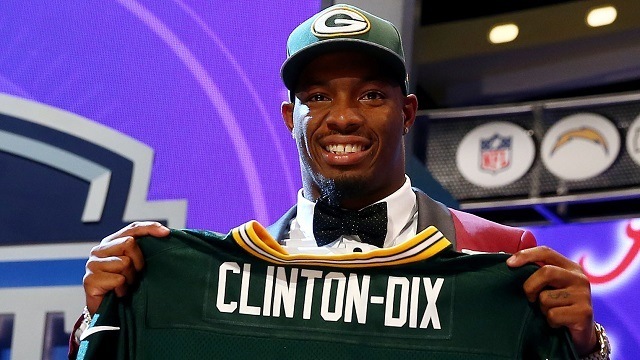 There’s an NFL football player named Ha Ha Clinton-Dix. And of course, there’s Hillary Clinton who’s running for president. A lot of jokes come from the fact that Ha Ha’s last name is Clinton-Dix, and Hillary is wife to Bill, who had an affair when he was president. So he’s somewhat seen as a ladies man, at least to comedians like Jimmy Fallon. So combining these two elements is almost too easy. And here’s another from Key & Peele, playing on the odd names we see in the NFL, even A.A. Ron Rodgers. Let’s talk fantasy football, shall we? Since, oh I don’t know, about 5 games into last season I was looking ahead to this season. Why? Because my beloved Billy Oceans were still looking for their first win. It took 4 more weeks to find the W. Yeah, it pretty much ruined the entire fall season for their owner… me. I’d show up to work Mondays and Tuesdays with a chip on my shoulder. But Tuesday nights the clouds would clear because that was when players on the waiver became available! Then Thursdays Yahoo! gave their expert opinion on each player’s outlook for the upcoming week. Forgetting the previous week couldn’t happen fast enough (and often didn’t). I was desperate for a win, no doubt. I ended up with a disastrous 1-12 record. Embarrassing from any angle. But rising from the ashes, the Billy Oceans exploded into the 2014 season with a 1-0 record. A feeling of relief when I get my second win… which hasn’t happened yet. I’m 1-2 now and the ghost of seasons past could very well be walking up the driveway. If I don’t win this week (week 4), the bone-chilling thought of a repeat season will tumble around my mind like a lone shoe in the dryer. Loud thumps I can’t ignore. But my tight end already got 20+ points from 3, yes 3, touchdowns on Thursday night. Thank you Larry Donnell! Because of you, my actual tight end is relaxing a little… till Sunday rolls around. I seem to be suffering from monthly “man stuff” today, but it’s definitely from unnatural causes—ahem, fantasy football. It’s funny and slightly disturbing that the start of the week can be so negatively affected by something this trivial—ahem, losing at fantasy football. Like, if I won this week’s matchup, all would be right in the world; I have a good job, good friends, two fun dogs, a couple of dates lined up, and an exciting week ahead. But when I lose, it’s just icing on the cake wreck; the world is falling apart, my job is difficult, my friends are lame, my dogs disobey and so do my dates, and this week’s outlook is boring with a chance of heavy disappointment. All because I didn’t start Dwayne Bowe and now—ahem, I’ve lost 4 games in a row. This “man stuff” stinks sometimes. Period. my life is just like this cake.